Headbang Club brings rhythm-based metal action to the PC with Double Kick Heroes -- and DualShockers got hands-on time at PAX East 2018. I remember the days when rhythm games were at the peak of its popularity. Franchises like Guitar Hero and Rock Band helped bring the genre to the forefront in a way that previously released rhythm games failed to do. Now it’s 2018, and the music-based genre is not as strong as it used to be with only a select few, such as Crypt of the Necrodancer, finding its way to a broader audience. Indie developer Headbang Club may be one of those shining stars with its rhythm action game, Double Kick Heroes. At this year’s PAX East in Boston, I had the opportunity to go hands-on with the studio’s inaugural title. We were given about 20 to 30 minutes to check out the game and everything it has to offer. 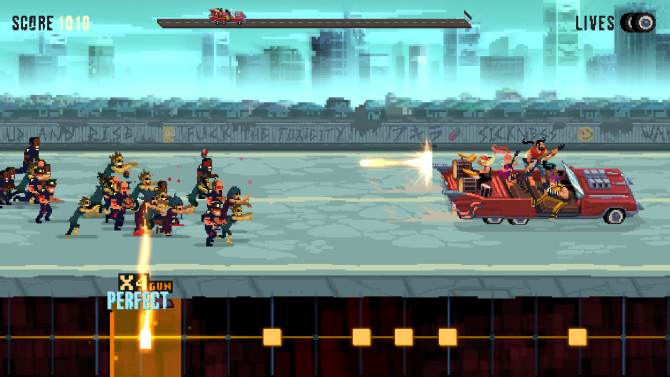 Double Kick Heroes is both a rhythm shooter and an homage to metal; gameplay involves you taking out hordes of zombies with a machine gun mounted car to the beat of music inspired by the heaviest bands music history. When I was watching others play it, the game looked awesome, but I wasn’t quite sure how it would control. Once I got my hands on it, I was able to quickly wrap my head around it. Once I went hands-on with it, the controls and gameplay were pretty easy to understand. A horizontal note path runs along the bottom of the screen; when a dot appears in the shaded area, you press the corresponding button. Every not you hit correctly will build your combo meter allowing you to do more damage, thus completing the level faster. This simple concept gets a bit complicated as you progress through each section when the song is more complex and when a second button is added. While I didn’t get to experience it, there is supposedly a third row of notes that will be added which, I would imagine, would be incredibly difficult. If that wasn’t enough, there are also boss battles that bookend each section that requires you to move the vehicle and shoot while tapping to the beat of the music. This is where things get clunky. Unless you can do all the button tapping parts with one hand, you’re going to have a hard time comprehending everything that is happening on the screen. Not only do you have to worry about your rhythm but also your aim, as well as making sure you’re out of the bosses way when it inevitably attacks. There are visual cues that will help you along the way. However, if you’re too cautious and don’t defeat the boss before the song’s end, you fail. It provided an enjoyable challenge but one I could see players getting frustrated with. Despite that, the controls, for the most part, felt great. Similar to the clicking of the strumming trigger on the plastic Guitar Hero guitar, the percussive clicking of the buttons is very satisfying as you play along to the music. If you do find it too difficult, there are five different difficulty options that cater to your level of play. I should mention that the demo stations at Headbang Club’s booth all had arcade sticks which is the best way to play Double Kick Heroes. However, I understand that not everyone, including myself, owns an arcade stick. I can’t speak on how the game would feel with a gamepad or keyboard, but when I asked the developers, I was told it still controls well. A rhythm game is nothing without good music. 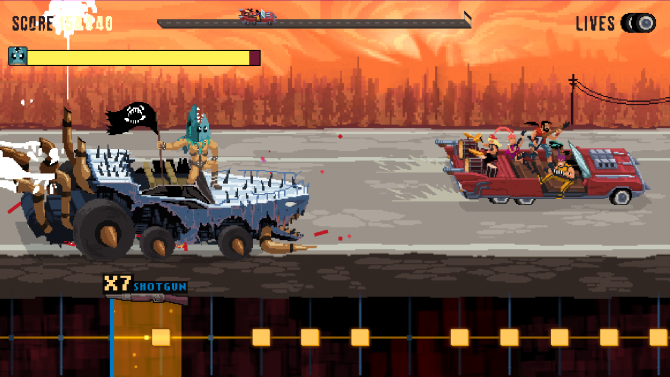 Fortunately, if you’re a metal fan, Double Kick Heroes has plenty of music inspired by many favorite metal bands such as Iron Maiden, Rammstein, and Meshuggah. Unfortunately, since it was on the loud show floor, it was hard to hear the exact beat of the music. What I could hear of it sounded great. As a metal fan myself, I want to see who the developer’s modeled their songs after. Visually, Double Kick Heroes is a pixelated album cover in motion. There is a metal band playing music on top of a car with guns mounted on it traveling through a post-apocalyptic landscape mowing down zombies. Sounds pretty rad, doesn’t it? The designs of the bosses, which typically took up a majority of the screen, were unique and stylish. The colorful and bright palette gives an inviting feeling to the game making you want to go back for more. All of this fits the metal theme the game exudes giving it a lot of personality and charm. 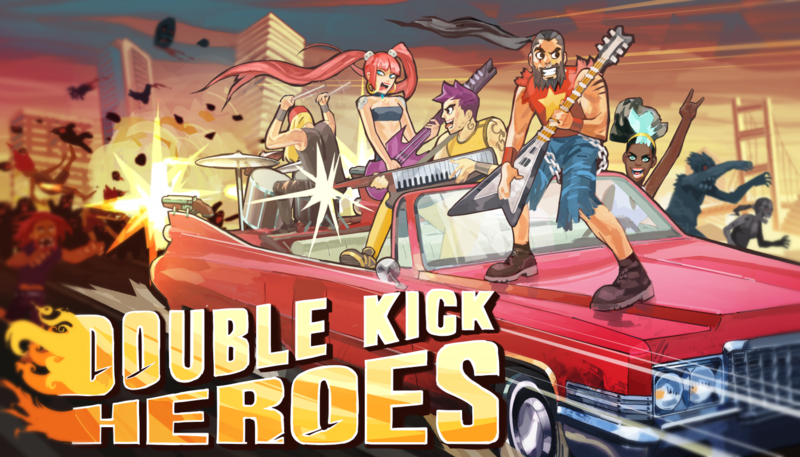 In a world where rhythm games are scarce, Double Kick Heroes is a breath of fresh air. After playing it, I wasn’t quite sure if I liked it. After playing a ton of games at the show and taking a moment to think about everything I played, this rhythm action game is sticking out as one of my favorites. 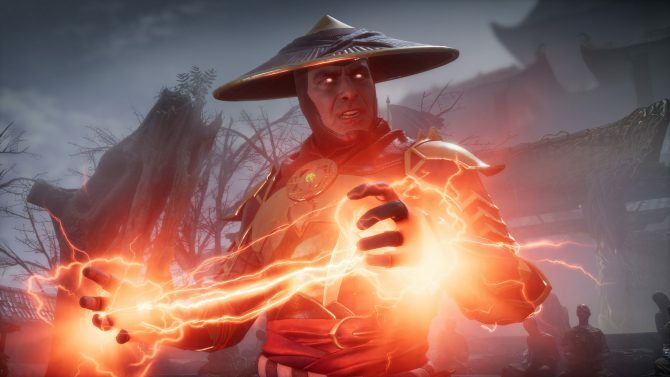 Since the demo I played had an arcade stick – which is clearly the way to play this game – I’m unsure how well it will control with a gamepad or keyboard which may be problematic when trying to sell this to a broader audience. Additionally, the boss battles may deter people from trying to progress due to the amount of skill needed to pass these challenging sections. However, with five difficulty options to choose from, a great pixelated post-apocalyptic look, and a killer soundtrack to listen to, anyone should be able to see the game through. From what I played, I can’t wait to take out more zombies to the beat the thrash, heavy, death, black, and any other subgenre of metal Double Kick Heroes has to offer. Double Kick Heroes will be available for PC via Steam Early Access on April 11.